9 sizes - 3 different lengths, 3 different widths. » Esker (noun): A serpentine ridge of gravelly and sandy drift, believed to have been formed by streams under or in glacial ice. 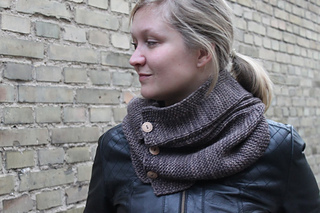 The Esker cowl / scarf is worked from side to side, with a subtle ridge along the length. It is suitable for men as well as women, and is given in 9 different sizes. The pattern gives a table for stitch counts and measurements per size. You then fill in the numbers and measurements that refer to your chosen size throughout the pattern. Yarn: The Uncommon Thread Lush Worsted (80% Merino, 10% Nylon, 10% Cashmere; 230 yards per 100g). Requirements depending on size - see last pattern photo. Needles: 4,5 mm / US 7 circulars or straight needles, depending on your preferred method. Other: 4 stitch markers, a darning needle, a piece of waste yarn for provisional CO if you are grafting the cowl together (optional). 3/4/6 buttons for size 1/2/3 in width, for buttoned cowl or scarf w/ cowl option (optional). Gauge: Before blocking: 19 sts & 31,5 rows on 4 inches / 10 cm in garter stitch. After blocking: 19 sts & 29 rows on 4 inches / 10 cm in garter stitch. Unless you want to keep to the measurements exactly, gauge isn’t crucial. Keep in mind that garter stitch will grow in length when washed. My gauge swatch grew by 8% in length when washed. 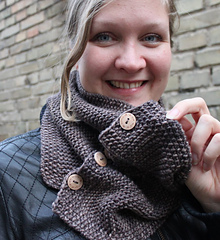 Scarf / buttoned cowl: The scarf or buttoned cowl is worked flat. 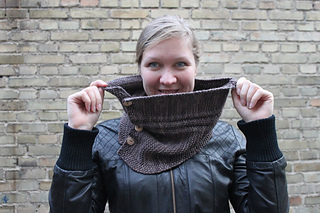 Fixed cowl: The cowl is worked flat, then joined in the round using Kitchener stitch. There are 9 different sizes available - 3 different lengths, and 3 different widths. 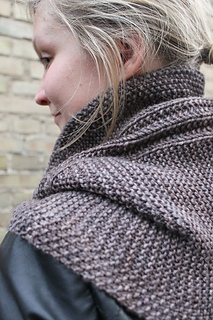 Apart from that, there is a choice for the cowl between buttoning it up, or grafting the ends together for a fixed cowl. Please see sizing table and yarn requirements in the last pattern photo. For the buttoned option, 3-4-6 buttons are needed for the narrow (LC1, MC1, SC1) - medium (LC2, MC2, SC2) - wide (LC3, MC3, SC3) width version.